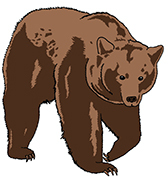 Tourists have a high probability to see brown bears in Slovenia from designated hides, to which bears are attracted by food. But, does this help to protect bears or not? After a short drive through the forest, the car stopped. Our companion; a local game manager and bear expert, instructed us to be as silent as possible. We went almost tip-toeing towards a small clearing. With a hand-signal, he told us to stand still: the bear was already there! We could hear our heart beating while we watched the large brown animal. As silently as we could, we climbed up a metal ladder towards a hunter’s hide. Occasionally, the bear looked up, evidently well aware of our presence. But the hidden bits of food were more interesting. From the hide, we could watch and photograph the bear for another ten minutes, before she retreated into the vast Slovenian forests. We waited. Slowly the sun went down. Jays, Woodpigeons, and Blackbirds came and went. A Robin sang. The forest has a special magic when you sit and wait quietly. Our guide made an almost inaudible sound but it was enough to wake us from our daydreams: the second bear had arrived. This bear seemed to think about every step, all his senses full alert. There was food here, but he didn’t quite trust what was going on. After he made a wide circle over the feeding place, he disappeared quietly into the forest. He hadn’t touched any of the food. A while later we saw the third bear and, on the way to the car, even a mother bear with three cubs. All together that was seven bears in one evening. A top-excursion! There are about 800 brown bears in southern Slovenia. People inhabit this area as well: there are villages and even the forest is dotted with cottages, hunters-huts, and bee-stables. Bears and people live close to each other. Most locals can tell stories of how they met bears, sometimes deep in the forest but also inside villages. Incidents happen: bears raid beehives, break branches out of fruit-trees and forage on compost heaps and in garbage bins. Even though a mother bear with cubs can be a dangerous animal, attacks are rare. When they happen, they are mostly a bluff to scare people away so the cubs can have a possibility to flee. For opportunistic animals like bears, there’s a lot to eat in Slovenia. If the food was the limiting factor, there is space for several thousands of bears, at least. In addition to natural food, there are numerous feeding sites for Wild Boar and Deer, and Bears come to eat here too. Naturally, the bear population would be growing. If the bear-population increases, the number of meetings with bears will increase, as will the number of incidents. We expect that, when this happens, the local attitude towards bears will change very quickly. And when people don’t accept bears any longer, there will, quite literally, no longer be a place for free-living bears. Every year the number of bears in Slovenia is estimated, and on basis of this estimation, a quota is set for bears which »should be removed«. Removal includes everything from bears killed in traffic (mainly when crossing railroads at night), to bears which are shot because of a poor condition and bears which are shot because they frequently come into villages and cause conflicts. The quota is further »filled« by shooting healthy bears. This annual removal of bears is seen as an essential measure to manage the Slovenian bear-population. It is in this light that we should see bear-watching. Of course, it is an unforgettable experience to see a bear, often from quite close by. In order to be able to offer this, we need bears to get used to feeding places. But, inevitably, those bears notice our presence, smell our smells and hear us approaching the hides. Some also see us, like the mother with cubs which was close to our car. We don’t do anything except taking pictures and some bears become very confident in our presence. Will Our Bear be Shot? In Slovenia, no bear stays in the forest all his life. There are too many houses and villages close to the forest and bears have large home-ranges. How would “our” bear react once she discovers that there is food in a garbage-bin, in the middle of a village? Would she still avoid all human smells and sounds, or, one day, boldly get breakfast in broad daylight? And how will the local villagers react? Until now, a bear which frequently comes to villages is nearly always shot. Will you be happy when this happens with “our Bear”? We love bears and support the presence of a healthy bear population in Slovenia. When eco-tourism can contribute to this, we are happy to offer bear-watching as part of our programs. Actually, we discuss these issues with our partner-organisations who offer bear-watching. We are also in contact with researchers and policy-makers. At this moment, we offer bear-watching as part of some of our tours. Whether we continue to do so, will depend on our future experiences. Our multi-day tour: Slovenian reptiles and the bear.